With plenty of elbow room the Homewood Suites by Hilton Kalispell offers smartly designed kitchens complimentary internet access and morning newspaper delivery. Free breakfasts are a pleasant way to wake up. National parks fan out in all directions from the four-story Homewood Suites by Hilton Kalispell. The 100 studio one- and two-bedroom suites have separate living and sleeping areas and kitchens with stoves microwaves refrigerators and even dishwashers. Pick up necessities at the on-site convenience store or take advantage of the free grocery shopping service. Free newspapers are delivered to your door and Wi-Fi access is complimentary. Look for flat-panel TVs with premium cable channels docking stations for mp3 players and spacious work desks with ergonomic chairs. Wake up to a complimentary breakfast buffet and enjoy of the evening manager's receptions. Pets are allowed with a nightly fee and parking is free. 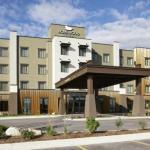 The hotel is north of downtown Kalispell making it a great base for exploring the region. Nature preserves are all around from Glacier National Park to the northeast Lost Trail National Wildlife Refuge to the west and Kootenai National Forest to the northwest. Big Mountain Golf Club is three miles north and Glacier Park International Airport is eight miles north.